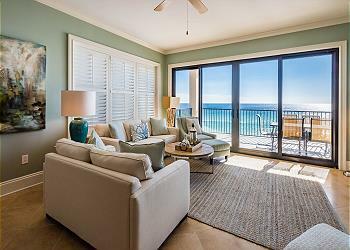 DETAILS: Situated on Destin’s pristine white beaches, Villa Coyaba’s 2,200 square foot luxury condominiums offer guests a beach haven of rest and relaxation. Featuring 4 bedrooms and 3 bathrooms, this sophisticated top floor, corner unit comfortably accommodates 12 guests and features top of the line furnishings, a Gulf front balcony with an unbeatable view, fully equipped gourmet kitchen and complimentary beach chair service during season. Villa Coyaba is nestled on Scenic Highway 98 and provides guests the convenience of being a short drive away from all of the world-class shopping and dining Destin has to offer. Feel sorry for anyone staying here in March because there is construction going on until after 8:00 pm in 301. Going to last through March. We are so sorry for the construction during your stay. Unfortunately, we are not always made aware of construction in other units unless it is a 360 Blue property. In spite of this, we hope you had some wonderful moments and join us at the beach again soon! We are so glad that you enjoyed your stay with us in Destin! We agree that this condo is a great place to sit back and relax while on vacation! We will be sure to share your valuable feedback with our team. Thank you for staying with 360 Blue, we hope to see you again soon! Always a pleasure booking through 360blu. Unit 401 was wonderful. We didn’t realize it did not have a fireplace but it was beautiful. We cook while on vacation some and the nonstick pans need to be replaced. Terrible condition. We love staying at Villa Coyaba. We have stayed there three times in the past. We will always book through 360 Blu. We are so glad that you enjoyed your stay with us in Villa Coyaba! We will be sure to share your valuable feedback with our team in regards to the kitchen products. Thank you for staying with 360 Blue, we hope to see you again soon! We stayed at Villa Coyaba 401 in Destin Thursday-Sunday for a girls trip. We had 12 total and had the time of our life! The condo was gorgeous and lived up to all of the pics that were posted. The beach was “squeaky” clean (the sand actually squeaks when you walk in it!) and was so soft and beautiful. Walking up and down the beach was a favorite activity for us all. We did venture out (hard to leave our beautiful “home”) to the Destin Boardwalk, which was a fun place with activities, restaurants and night life. The property company 360 Blue is very attentive and great to work with as well. We all had a fantastic trip and would highly recommend the unit to anyone. We are already thinking about when we can come back. Thanks so much for a fantastic vacation! We are so thrilled that you and your group had a great girls getaway with us in Destin at Villa Coyaba! We agree that this condo is amazing and more than accommodating for larger groups and our beaches are second to none! We would be honored to host you all again and we hope that is soon! While we had a wonderful time this unit does not stand up to other units in Villa Coyoba. We have stayed at Villa Coyoba in the past. 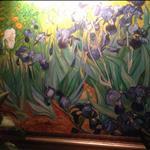 The flooring is in terrible condition and the kitchen stove top needs replacement. We hired a chef to cook for us and the oven temperature was not reliable and the broil never worked. The chairs and couches are badly stained. If you are going to charge the same as other units in the building then the conditions should be the same. Being the end and top unit of the building was nice and quiet. We are so sorry that your stay with us was less than perfect and we will be absolutely sure to share your valuable feedback with our entire team so that we can attempt to make some corrections for future guests. We are happy to announce that our homeowners have made plans to install brand new gorgeous flooring, a new refrigerator, and appliances! We hope to be able to host you all again soon! We love everything about this condo! The parking spots are GREAT. The unit definitely has a “beach-vacation” vibe. The view is gorgeous. There are enough bath towels for everyone. I would suggest a Keurig coffee pot and possibly a new stovetop; it was hard to cook on it because the heat settings were worn off. Besides that, we had an amazing vacation! 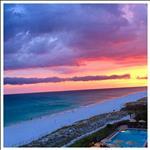 We are so thrilled to hear how much you enjoyed your vacation with us in Destin! We agree that the condos at Villa Coyaba have an amazing view and accommodations and the wonderful photo you shared is proof of that! We appreciate your feedback and we will absolutely share this with our team to hopefully rectify this for future guests. We look forward to seeing you all again soon! Our family of 7 had a fabulous vacation. We always stay at Villa Coyaba and this is our favorite room! The recent renovations look terrific and the view is unbeatable. We will be back! We are so glad you enjoyed yet another stay at Villa Coyaba! We agree these condos are hard to beat! 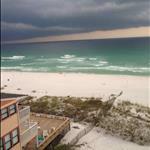 The photo you shared is amazing and shows just how wonderful the beach is behind those amazing condos! We look forward to seeing you again very soon! What can we say other than it was perfect!! From the booking of the condo throughout our stay, it could not have been better. Villa Coyaba has the best crew working there from Preston to the lady doing the power washing to housekeeping and to Daniel who setup the beach chairs, who was always so helpful. It is kept so clean. The concierges have been fantastic! Villa Coyaba is centralized, the beach and the ocean are beautiful as well as the view. Thank you so much to the owner of the condo for the gift. We used the honey for the pineapple that we grilled. We have been coming here for several years and absolutely love it. Thank you. We are thrilled to hear that you had such a great stay. The staff at Villa Coyaba is truly second to none and we are lucky to have them. We love seeing you back year after year and look forward to next year! What a great group photo! We are so pleased to hear you enjoyed your stay with us so much! Thank you so much for choosing 360 Blue for your beach vacation and for taking a moment to share your experience with us. We look forward to helping you plan next year's trip! Our yearly tradition with our family! We had a wonderful time. Stayed in 2 Condos at Villa Coyaba. 7 of us in one and 5 in another. Everett/ Hudspeth/ Hendrix Vacay! We love seeing all those beautiful smiling faces! 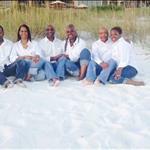 We are thrilled you and your family had such a wonderful vacation in Destin! Thank you for staying with 360 Blue and we hope to have you back again soon! 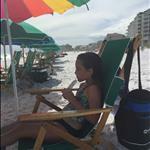 Our family of 9 enjoyed another beach vacation in Destin. The 4 bedroom condo worked out perfectly. The view from the balcony was amazing and we enjoyed morning coffee and lunch there each day. We will definitely return. Looks like it was the perfect day to spend at the beach relaxing! We are thrilled you enjoyed the condo so much! The views can't be beat! Thank you for staying with 360 Blue and we can't wait to have you back at the beach again soon! Wonderful place to stay! •Great location •Private beach •Free bike rental •Beautifully decorated condo that was equipped with everything we needed •Ice maker was a HUGE bonus •Building grounds were kept very nice-loved grilling out! We would definitely rent here again! I gave it a 4 star rating for cleanliness because the dining room furniture had quite a few stains on it and the tile floor needed to be mopped when we arrived. Not a deal breaker though. What a beautiful day to be at the beach! We are so happy that you and your party had such a wonderful vacation in Villa Coyaba. We do apologize about the few cleaning issues and rest assured we are working hard with our housekeeping department and property manager to make sure those issues get addressed. Thank you so much for staying with 360 Blue and we hope to have you back again soon! Enjoyed our visit very much. The ice maker in the refrigerator does not work and there is a shelf missing on the refrigerator door. Nevertheless VC 401 is a wonderful condo, very clean and very well appointed. Such a stunning photo! We are so thrilled you had such a wonderful stay in Villa Coyaba. Thank you for your valuable feedback and letting us know about the shelf and ice maker, we will have that fixed right away! We can't wait to have you back at the beach again soon! The condo was so beautifully decorated, and we enjoyed our stay very much! The balcony was huge! Villa Coyaba is also in a perfect location. We are so thrilled that you enjoyed this amazing condo. We hope to see you back soon! Beautiful condo and very spacious for our multi-generation family! Beautiful, spacious condo with great views and great location! We are so thrilled that you had such a great stay! We are looking forward to having you back soon! The condo was VERY nice! We will definitely be back! What a fun family filled photo! We are so happy you had such a great vacation! Thank you so much for choosing 360 blue and come back to visit us again soon! Had a fantastic week! The condo is absolutely beautiful and very clean. Loved this particular part of Destin. Not too crowded and enjoyed the complimentary bikes. Will definitely be back to this condo. Villa Coyaba has such amazing views of the gulf! We couldn't be happier that you and your family had such a wonderful vacation! Thank you for choosing 360 Blue and we can't wait to have you back at the beach again soon! The unit was beautiful and very clean upon arrival. The views and location were perfect. It would have been nice to have some larger pans for cooking and softer sheets on the beds. What a beautiful photo! The sunsets from Villa Coyaba are truly amazing. We are so glad to hear that you enjoyed this condo. We are so sorry for any frustrations you had with the housewares and we will be sure to have the property manager look into these issues. We really appreciate your feedback. Hope to see you all back soon! We had the most wonderful beach experience to date and we come to this area every year. The condo was decorated beautifully and so well taken care of. The attention to detail was impeccable. The beach area was so exclusive, not crowded and easy. A real dream of a vacation. We will definitely be back to VC 401! 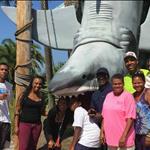 We are so thrilled that you and your family enjoyed your beach vacation! What a beautiful family photo and looks like everyone enjoyed the beach! Thank you for choosing 360 Blue and please come back and visit us again soon! Enjoyed our stay over New Years. Condo was beautiful with a fabulous beach view!! Can't wait to go back!!!!! This photo practically oozes serenity! The views at Villa Coyaba are so breathtaking! We are so happy you and your family enjoyed your stay over New Years! Thank you for staying with us at 360 Blue! We hope to see you back again soon! We have been going on a family beach trip for a few years now and the entire family agreed that this year was the best!!!! The condo was great for a family of 9!!! We loved the free bike rentals, which allowed the young adults to get out and explore the area. We all loved the shopping and dinning that was within a bike ride distance. We also took advantage for the grills, heated pool and the beautiful beach. On our last day we discovered that wave runners were availabe to rent just a short walk up the beach, which was really convenient. Our family has cast their votes and it looks like we will be back here next year!!! What a great picture! Looks like the whole family had a good time. We're so glad you chose 360 Blue for your annual trip. Let's make it a tradition! Thanks. Traveled for Louisiana CLE. Place was great! We look forward to next year! Thank you for visiting from Louisiana! Can't wait to have you all back to Villa Coyaba! Thank you for staying with us! Hope to have you back next year! Gorgeous weather, gorgeous condo. New furnishings on the patio were nice. Will be back to 401 next year!! Sunsets were amazing!! That sunset sure is amazing! We are so happy to hear you enjoyed the condo. See you next year! This is our third year at Villa Coyaba, and we enjoyed it as always. We did have problems with the wifi connection in our unit and it would have been great to have some lounge chairs on the patio area. The unit was clean and comfortable and the easy access to the beach is wonderful. Amazing photo! Thank you so much for choosing 360 Blue for your summer vacation and for taking a moment to share your experience. We will certainly discuss your suggestion for patio furniture with the homeowner and have our maintenance team look into the wifi. We are glad to hear that these minor inconveniences didn't stop you from having an amazing vacation. (That view!!!) We to see you back at the beach soon! We have just arived after a long drive to our unit and we are all so tired. My gaurd is usually up when we have rented properties in this area bc of some bad experiences. This has to be one one of the nicest condos, houses, anywhere that we have steyed at the beach in a VERY llong tine!!! Its spaciuius, plenty of parking , CLEAN. There are an abundance of towels and the kitchen is appointd beautifully. I love and so appreciate the details beautiful appliances. Its the first time in a very long time that I can say it is way better than I expexted!!! Very happy to be here- prob will never rent from anyone else in future bc you delivered what uou pronise!!! And the services available and ammenities are making this the most perfect, fun, relaxing spit to be!! Thsnk you!! We are so glad that we were able to help you let your guard down and really enjoy this fabulous condo and the wonderful surrounding area. We could not be more thrilled to hear that we exceeded your expectations and allowed you to truly relax. We would be so happy to have you back! Give us a call when you're ready for your next beach retreat!